As the holiday season approaches get in the spirit of giving! There is no better time to help out those less fortunate than yourself. Wherever you may live, there are plenty of ways to give back, and make a difference to those who need it. As the temperatures are dropping, snow is falling, and wind is blowing, there are plenty of people who may not be so lucky to come home to a heated house, or survive the chill with warm, protective clothing. At Party Plus we want to give back, and that is why we are hosting our Second Annual Mitten Tree Project! For those of you who do not know, a Mitten Tree allows us to collect pairs of mittens, gloves, or even scarves from our dedicated clients throughout the month leading up to the holidays. At the end of the month, our tree packed full of mittens will be donated to The Maryland House of Ruth; a shelter and violence protection center in Baltimore helping battered women and children and giving them a safe place and their necessities when in need. 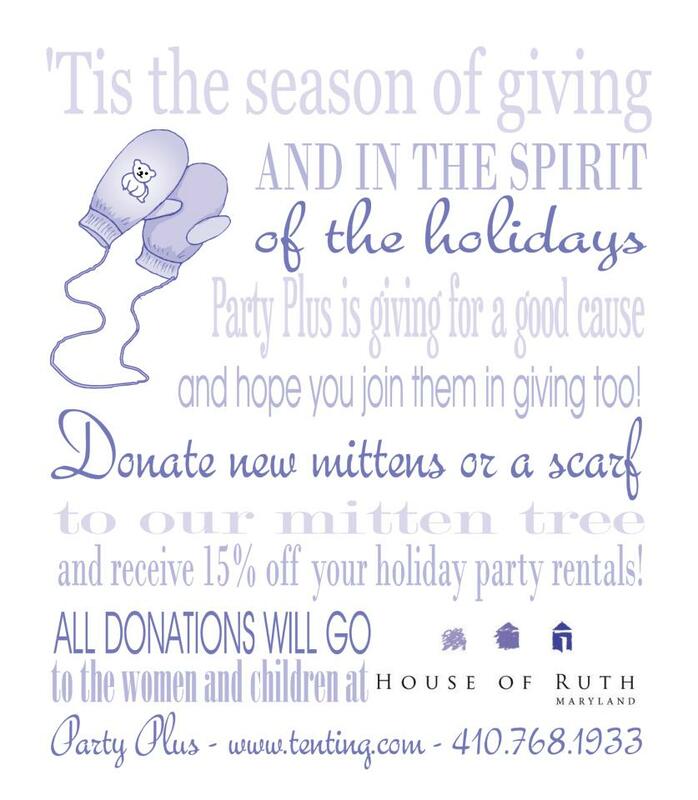 Since this is the season of giving, check out the Maryland House of Ruth website and find other ways you can help out. And how are we at Party Plus giving back to you? Donate a pair of mittens to our Mitten Tree and get 15% off your rental!